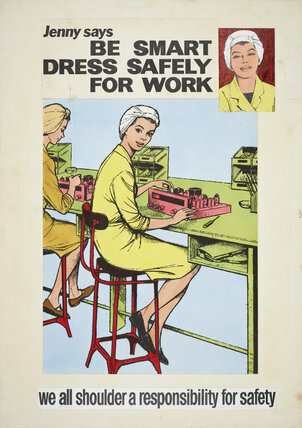 The entry of large numbers of women into the industrial work environment required a different kind of safety awareness linked to the practicality and suitability of clothing. This is a poster with a message to women that the workplace is not a fashion parade. Why do we Look that Way First Mummy?